Flickr.com is one of the world's most popular image hosting web sites. and contains many hundreds of millions of images. 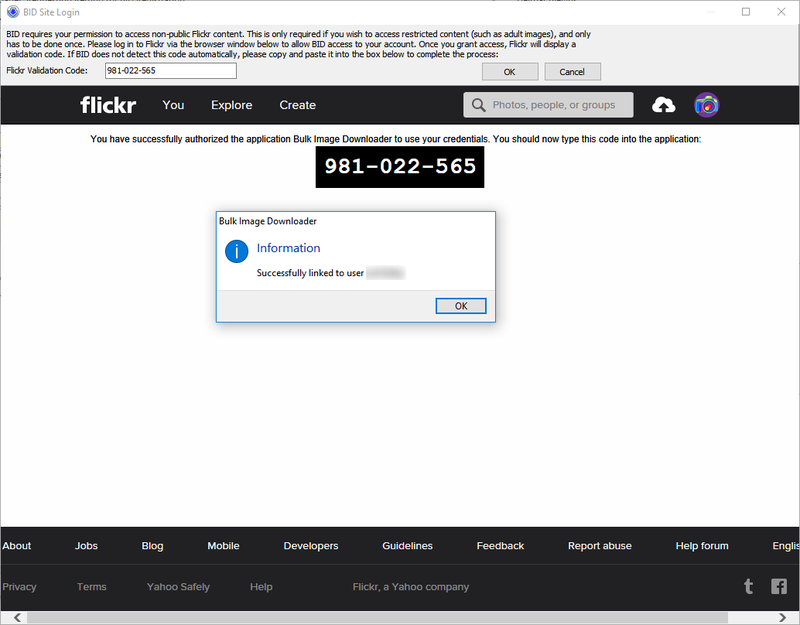 If you're using the unregistered free trial version of BID then you will be limited to a single flickr image download at a time. Registered versions of BID allow for up to 5 simultaneous flickr downloads. If you wish to access restricted content (such as adult content) on Flickr you must link BID to your Flickr account. 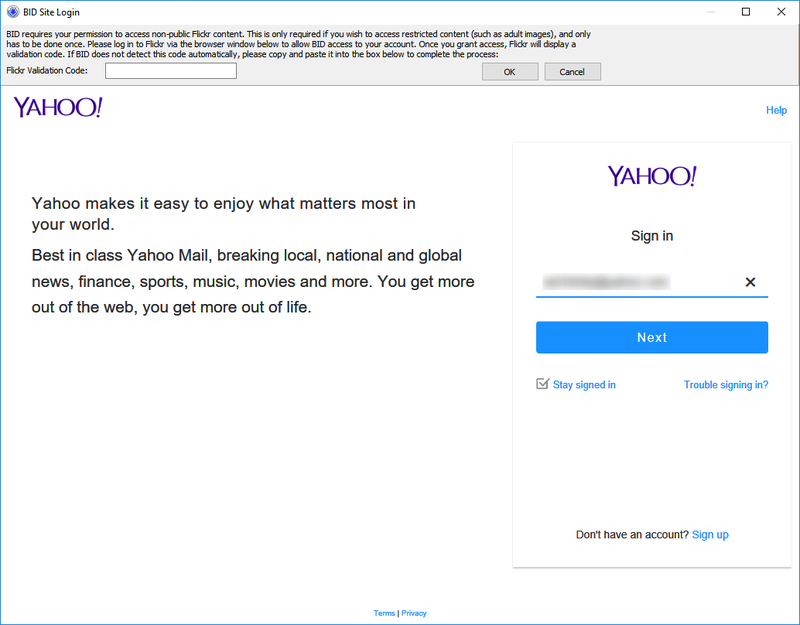 This is not required if you only want to access unrestricted "public" images. This process only has to be done once. 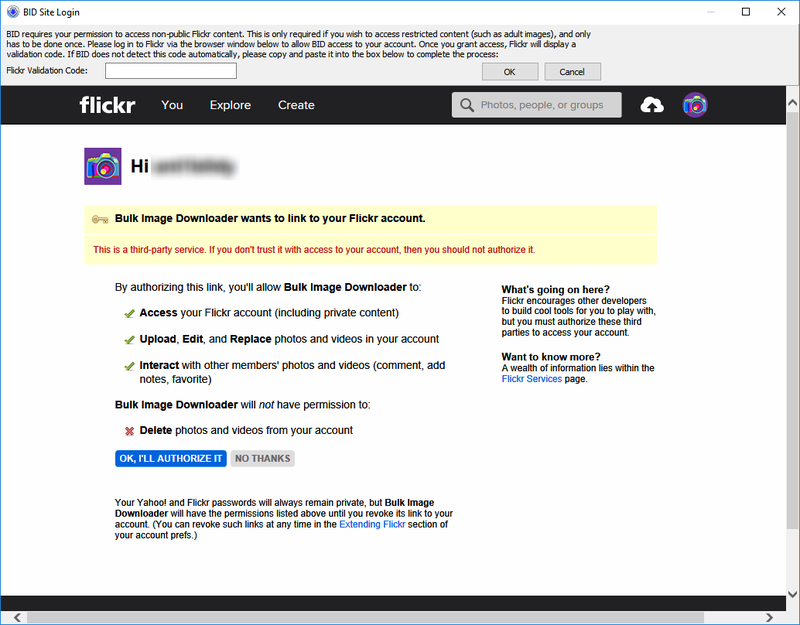 Once you have completed the login process, you will be prompted to authorise linking BID to your flickr account. Click on "OK I'll Authorize it" to grant BID access. Once you complete the authorisation a special "Verification Code" will appear. If BID doesn't detect this code automatically, please copy and paste it into the "Verification code" text box at the top of the screen and click the OK button. 1. Navigate to a flickr.com web page containing thumbnailed links to the images you'd like to download (not an individual flickr image page). This can be a search result page, a photostream page, a set page, or any other page on flickr.com containing thumbnailed images that link to single image pages. 2. Right click inside the web page and select "Open current page with BID". (FireFox users please install the BID FireFox extension to enable browser integration, Google Chrome users please install the BID Chrome extension). BID integrates automatically with Internet Explorer. 3. BID will open and begin loading each page from the currently selected gallery. By default BID loads a maximum of 20 pages. To increase this change the "Download multiple forum pages. 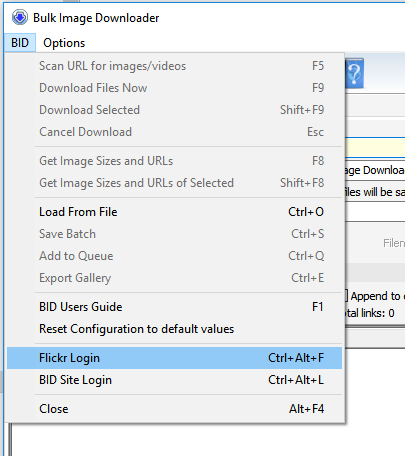 Max Pages" setting on the BID configuration tab. To stop BID from loading multiple pages click on the Cancel button or press Esc while it's downloading the pages - it will then process only the pages it has already downloaded. 4. Once all the pages have been downloaded BID will scan them for thumbnailed links and display them. As full sized images are desired make sure that the BID Filter is set to 'Thumbnailed images only' (press Alt+1). If the filter is set to 'Embedded images only' then BID will download the thumbnails on the pages instead of the full sized images on the linked pages. 5. You can now browse through the images on the list. Click on the view buttons to display the results as a list or as thumbnails of different size. 6. When browsing the results, you can double click on an image item in the detailed view to view the thumbnail image. Double click on thumbnailed images to view the full sized images. Delete the images you don't wish to download from the list by selecting them and pressing the Delete key. Select multiple images by shift and/or control clicking on the images. 7. Once you're satisfied with the results click on the 'Download button' (or press F9) to begin downloading the images. The images will be saved to the specified "download to" folder, optionally within a new subfolder named after the current page title (if the 'save to web page title subfolder' option is enabled). To download just the selected images, hold down the shift key while clicking the download button (or press shift+F9). By default BID will try to download the original sized images, and if not available, the next largest available. The preferred flickr image size to download can be set via Configuration->Advanced Configuration->Images->Flickr preferred image size.